This smaller game fish is found Gulfwide in sandy bottom areas. Depending on their spawning cycle, you will be able to find them in shallower, near-shore waters and higher salinity estuaries, as well as in more offshore in depths up to 30 feet. Description: The Gulf Kingfish can be identified by its silvery/tan coloring and high dorsal fin. It differs from the Southern Kingfish in that it does not have very evident bars of color across its body. Because of its small, under-drawn mouth, the Gulf Kingfish is hard to catch without a small hook and natural bait. Size: The Gulf Kingfish is a smaller game fish with its highest weight ranging around 2 lbs. Most often, the Gulf Kingfish weighs in at less than 1 lb, but it yields a large amount of meat, making it perfect for fillets. Location: The Gulf Kingfish is found more often in higher activity waters. While it's relative the Southern Kingfish prefers quiet waters, the Gulf Kingfish cannot tolerate low-salinity water, and it is often found in surf zones. During the summer, the Gulf Kingfish moves offshore to spawn in waters up to 30 ft. deep and returns to shallower waters later. 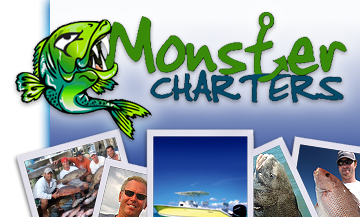 Contact Monster Charters today for more information about our fishing charters, kingfish sport fishing, and the other fish types and angling opportunities we have waiting for you.